Fans slammed Khloe’s enormous wig. 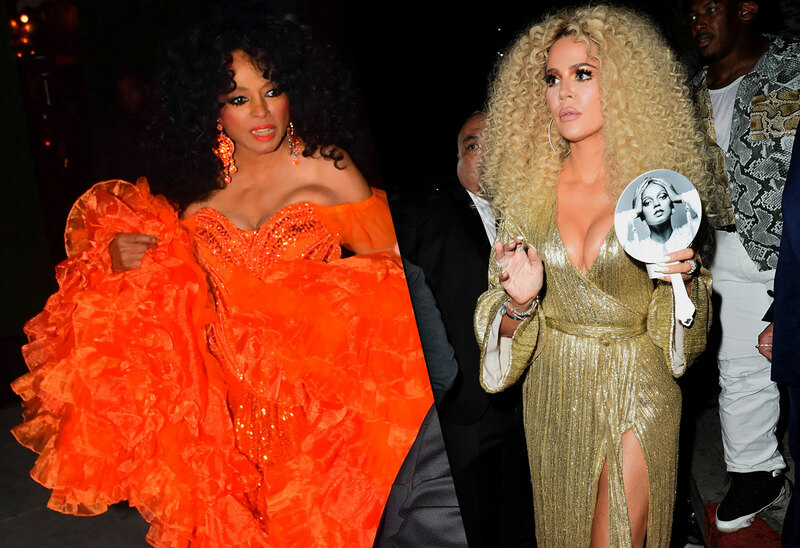 Diana Ross celebrated her 75th birthday at a huge, glamorous birthday party in Los Angeles on March 26. And Hollywood’s biggest stars came out for the event, including Beyoncé, Khloe and Kourtney Kardashian, Kris Jenner, Angela Bassett and Diddy. And while most people perfectly mastered the night’s sparkly theme, some fans thought Khloe’s enormous curly wig was inappropriate. Click through the gallery for all the info on the night, including Beyoncé’s happy birthday performance! Diana looked incredible in a huge ruffled, orange gown as she made her way into the party. The theme of the party was #DiamondDiana. Khloe, 34, and Kourtney, 39, both wore sparkly outfits, perfectly in line with the theme. The older sister opted for a silver sequin suit. Khloe wore a gold gown with tons of cleavage. But more controversial was her huge blonde wig. Fans criticized her on social media for appropriating black culture. “Everybody wanna be black.. 😫🙌🏾,” one person wrote under a video of her. Kris, 62, wore a teal sequin gown with a high neck. Boyfriend Corey Gamble accompanied her for the evening. Khloe also shared a video of Beyoncé, 37, leading happy birthday at the festivities. Diana’s daughter Tracee Ellis Ross turned the mic over to the singer for the sweet serenade. Later in the evening, Diana performed for her guests. She even brought Kourtney and Khloe on stage with her. DJ Khaled also performed with the Supremes icon. Diana’s daughter-in-law Ashlee Simpson wore a green jumpsuit, which she accessorized with huge hoop earrings. With her was husband Evan Ross. Heidi Klum attended with fiancé Tom Kaulitz. New mom Gabrielle Union wore a graphic black and white gown. With her was comedian Chris Rock, since husband Dwyane Wade was in Florida with the Miami Heat. Chris looked sharp in a powder blue suit. Saw the gorgeous Angela Bassett at Ms Diana Ross’s Amazing Birthday Party tonight. Beyoncé’s mom Tina Lawson shared a photo of herself with Angela, 60, inside the party. Bebe Rexha wore a purple sequin jumpsuit. As Star readers know, she’s opened up about the struggles of getting designer clothes for her curvy body in the past. Diana had multiple wardrobe changes throughout the night. She left the festivities in a black dress with a pink fur jacket. What do you think of Khloe’s wig? Was it inappropriate? Sound off in the comments!